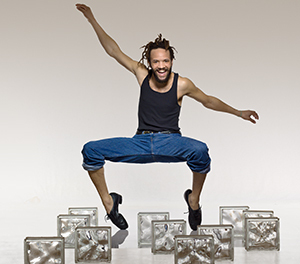 DanzeOff is excited to have Savion Glover as a member of our faculty for our 2017 dance convention and competition in Washington D.C.. Mr. Glover brings a depth of skill, knowledge, and passion for dance that resonates with students and viewers in a way that is almost unmatched in the world of modern dance. Savion Glover, a Tony Award-winning tap dancer, choreographer, and producer, is celebrating more than three decades in show business. Some of his Broadway credits include The Tap Dance Kid, Black & Blue, Jelly’s Last Jam, and Bring in ‘da Noise Bring in ‘da Funk. Glover has appeared in the movies Tap with Gregory Hines and Sammy Davis, Jr., and Spike Lee’s Bamboozled, among others. He also choreographed the Academy Award Winning films Happy Feet and Happy Feet 2. Most recently recognized for his award-winning choreography in the acclaimed Broadway musical Shuffle Along, Mr. Glover continues to focus on bringing attention to the art of tap dance as an important style of dance as well as creating highly entertaining visual performances. Mr. Glover has also danced alongside legendary jazz musicians such as Jack DeJohnette, Roy Haynes, and McCoy Tyner. In his hometown of Newark, New Jersey, Savion Glover holds the honor of being on the board of directors at the New Jersey Performing Arts Center where he also serves as their Dance Ambassador. Glover also established The HooFeRzCLuB School For Tap as well as Savion Glover Productions – a production entity highlighting the tradition of tap dancing and sound that also serves as a team-based organization that provides quality production and project management services focused on tap dancers.